I wanted a healthy green smoothie after my workout the other day and wanted to try something different than my normal banana and spinach protein smoothie. I had a pear and an avocado that needed to be used so I figured this was a great smoothie to make. This recipe was adapted from here. I made a few changes from the original recipe. Normally, well more like every single one of my smoothies, have 1/2 – 1 banana in it. Well I am so glad I tried something new! I absolutely loved the apple in this smoothie! I think I’m going to need to add apple to more smoothies. It’s better to add more of a variety of fruits anyway! This recipe, with 1 scoop protein powder and all other optional ingredients, yields approximately 385 calories and 23g protein. I am loving this spring weather! With this warmer weather, I am craving even more fresh fruit than I usually do. As a vegan potluck was approaching, I began to think about what I could bring. I usually bring an entree and a dessert. The dessert is usually made because most desserts that are brought to the potluck are not gluten free. If I bring my own gluten free dessert, than I am guaranteed a sweet treat after dinner. Last time I brought the Raw Brownies since I love chocolate and this would satisfy my sweet tooth in a perfect and healthy way that I also thought others would enjoy. But this time as I began to think about what to bring, I knew I wanted a nice light assortment of fruit! No one has brought any type of fruit platter before so I thought this would be perfect. Then I had an even greater idea! Why not arrange that fruit into a cute shape that would be perfect for spring. 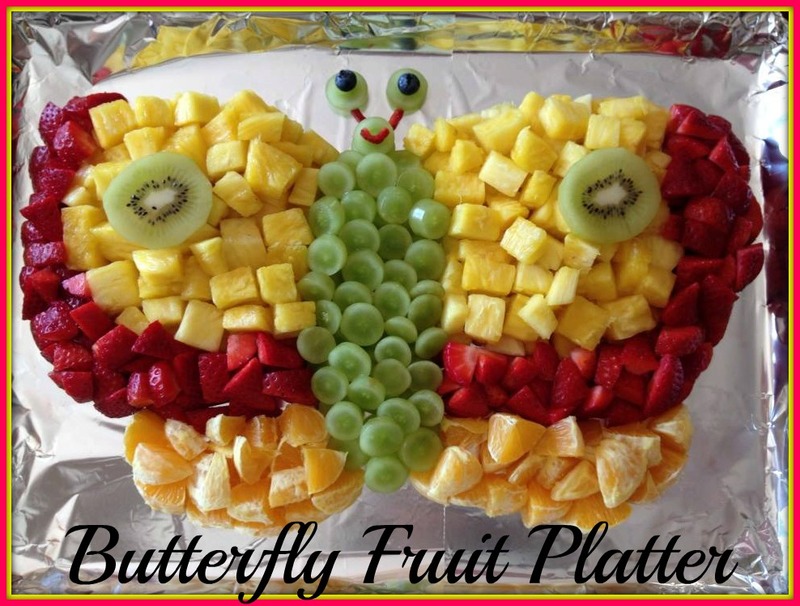 And that is what inspired this Butterfly Fruit Platter! Chop strawberries, pineapple, and oranges. Add 2 slices of kiwi for the decoration on the butterfly’s wings. Add 2 slices of green grapes for the eyes with 2 blueberries for the pupils. Lay out the grapes starting at the top and working my way down the body, slightly overlapping each grape. Add an extra layer of grapes on top, so the butterfly will be two layers of fruit. Outline the wings with the pineapple then fill it in so the pineapple is at the same level as the grapes. Do the same thing with the strawberries, then the oranges: outline first then fill it in to it is all at the same level. This fruit platter can be made with any type of fruit! You can use what is in season, you can use different color fruits to get different colors of butterflies, you can add more creative designs to the butterfly’s wings, or anything else you can think of! I love yogurt! It was one of the hardest, and the last, thing I gave up when I went vegan. I had just fallen in love with Chobani Greek Yogurt, probably had only been eating it for a year (if that). But when I realized it was practically the only thing that contained animals that I was still eating, I knew I could sacrifice that to help save the animals. And now I realize what a difference I am making by not supporting that industry. The dairy industry is one of the worst. Here’s an article on just how bad the industry is; it’s very disturbing, but it’s the truth and just because you ignore it to continue eating cheese and milk, doesn’t mean it isn’t happening to countless animals every. single. day. So, back to what I was saying, I am glad I gave up yogurt for the animals. Especially when I found out that I actually can still enjoy yogurt – Almond yogurt, coconut yogurt, or soy yogurt. Soon I will write a post about the differences of all these yogurts and my favorites, but for today I want to talk about a recipe for “yogurt”. I say “yogurt” because this recipe doesn’t contain probiotics, but it has a texture of real yogurt and the lemon helps add some tang to make the taste similar to what you may expect in yogurt. In fact, when I first saw this recipe I didn’t even want to call it yogurt because it reminded me more of a chia pudding, but I was intrigued by the lemon and even the cashews. Even though this still wasn’t yogurt to me, it sure was the closest I’ve ever come to making “yogurt.” Plus, it didn’t cost $2 to buy. This was thick and creamy and I loved the hint of lemon flavor. Soak cashews in water for at least 20 minutes. Soak chia seeds in 4 tbsp of almond milk for at least 20 minutes. Drain the cashews and add to a high speed blender. Add the soaked chia seeds and all other ingredients to the blender. (I only added 1/2 the banana and saved the other half for topping). Place in fridge to chill for at least 20 minutes. I topped mine with the other 1/2 of the banana and added maca powder to mine for some extra nutrition. You can also blend in some protein powder. Nuts, granola, and other fruits would also make a great topping. If you really want to make this like real yogurt with probiotics, you can buy some probiotic powder and add about a tsp to the ingredients before blending. I haven’t bought this yet so I don’t know if this brand is good or not, but it is the one I may buy in the future. Sorry no picture yet! As I was eating this for breakfast this morning, I surprised myself by how much I liked it. I wasn’t planning on taking a picture and it wasn’t the prettiest looking bowl I could make. I’ll for sure be making this again in the future and will include a picture when I do! 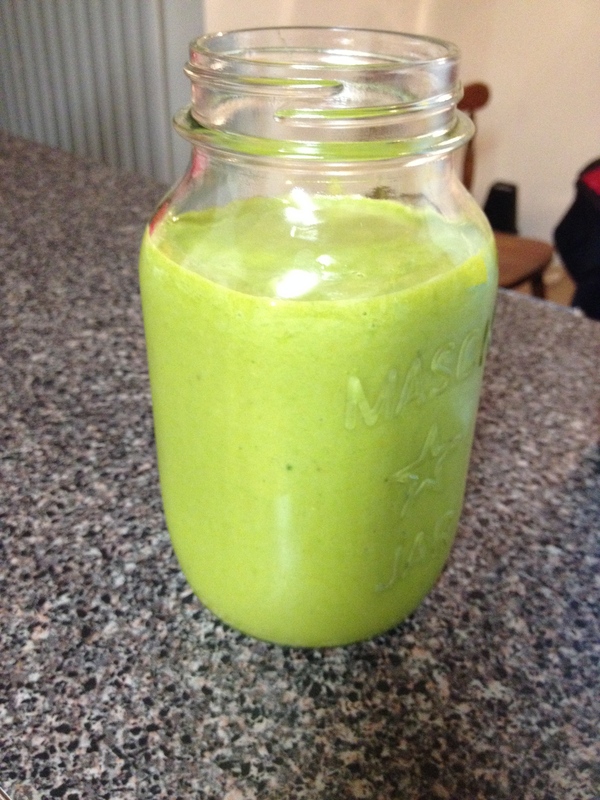 I am participating in this Green Smoothie Challenge from Simple Green Smoothies. They have a lot of really good smoothies posted on their page and when I saw that they had a smoothie a day challenge (four times a year) and that one would be starting shortly, I knew I needed to sign up! Especially since it is free! I thought it would be a good way for me to try new smoothie recipes with different types of fruit than I usually use. I also like that they send out a list of all the items that you will need for that weeks smoothie. It makes shopping for the ingredients very easy. Also, they only give 5 smoothie recipes for the week so that you can remake your favorites the other two days, try a different one from their website, or try a different one from somewhere else. 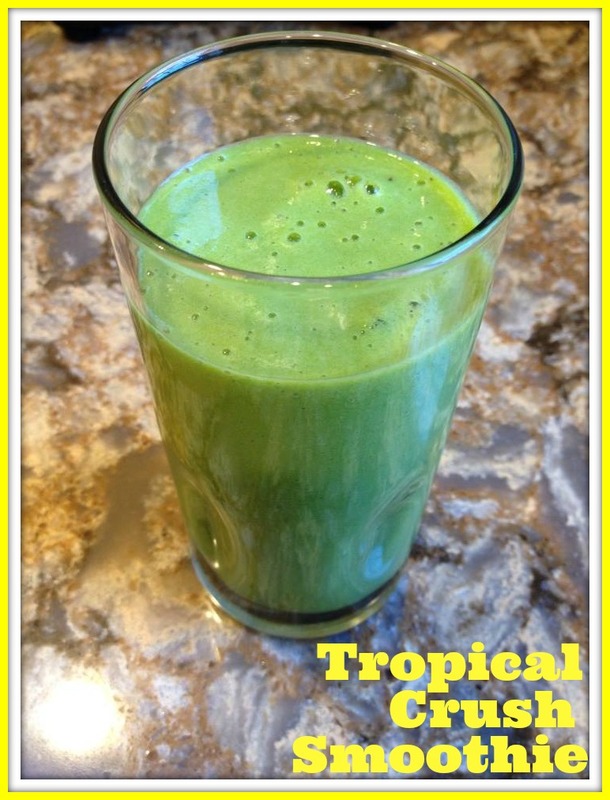 I was planning on trying a different one on their website for the 6th day of the challenge, but I loved this Tropical Crush Smoothie so much that I decided to make it again. If your are used to drinking green smoothies, you can increase the spinach (I did). You can also try adding different types of greens. You can also add other ingredients to your smoothie for more nutrients. Like protein powder, chia seeds, flax seeds, maca powder, coconut oil, etc. I added 1/2 scoop of protein powder and a tsp of maca to get more nutrients in my smoothie (my typical additional ingredients). Update: I was about to post a new smoothie recipe and realized what I created was pretty much the same thing as this smoothie. It had all the same ingredients, just different portions of each. I thought I would include the new portions here because I enjoyed the smoothie so much! Lately, I have been adding extra banana in my smoothies which is the biggest change here. If you love bananas as much as I do, definitely give this updated version a try! If your not as crazy about bananas, stick to the original recipe above.